Colonization: Built off the Civilization 4 engine. 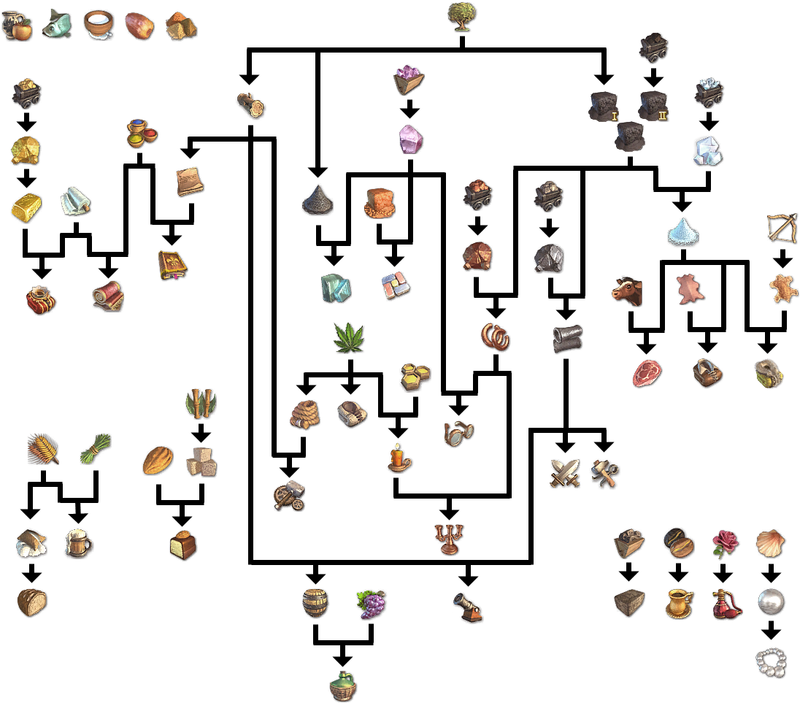 You build cities near resources on the map, which you can harvest using units of various skill levels, which can then be processed into various goods, again by units of various skill levels. Theoretically you need to build liberty so you can declare war against your colonial power, but I always quit before that stage, because why would I spent time on war when there are supply chains to build. You have to move goods between cities (for processing and selling to the mainland) manually, which makes this my low-thought comfort game. Anno (1404): This is a whole series based on both trading and supply chains. I would say they made it just for me but there is a combat section :(. I’ve only played Anno 1404, supposedly the best of the series. Anno 2070 is set in post-apocolyptic water world, which seems like it’s even more for me, but it has annoying Ubisoft DRM so I’ve never actually played it. Anyway, the mechanics. James Recommends does a better job explaining than I will, but it is a video, so I will try anyway. You start on an island that has all the resources you need to keep your peons alive, which you provide by building resource extractors (apple farms) and processing plants (cider mills). As you make them happy they evolve into better people, enabling you to tax them more and build new buildings. Which is good, because these better people have more demands for making them happy. Complicated demands. For example, Patricians want books, which requires a printing house. Books need indigo (which requires a sufficiently large Oriental settlement on an island fertile for indigo) and paper, which requires a paper mill, which requires lumber input, which comes from a lumberjack hut. Oh and paper mills can only be built on rivers, so you might have to find an island just for that. That’s not too bad. But you also have to build the printing house, which requires glass. Glass comes from a glass smelter, which needs quartz (which requires a higher level Oriental settlement and a quartz quarry) and potash, which comes from a glassworks building that runs on trees. What is most unique about Anno is that your resources are limited to the island they were farmed/created on, and if you want them on a different island you have to move them with ships. Unlike every other game I can think of, Anno lacks a staffing mechanic. All buildings come fully staffed, even if there’s no housing on their island (and there are reasons you generally concentrate your housing on two islands). Housing is essentially a tax farm, with which you get money to build more buildings. I think the purpose of combat here is to create something for you to spend money on that is not more buildings, which is fine, but it involves more strategery and uncertainty than I feel like dealing with in my leisure time. Luckily, Anno lets you turn off pirates and rivals completely so I can build my little anthill uninterrupted. Tropico: I think I’ve played Tropico 1, 3, and 4, which is enough to say they’re all the same and it doesn’t really matter which one you get. * In Tropico you are the Presidente of a banana republic, and have goals like “build a kickass diversified economy” and… I didn’t commit the others to memory. I think one involves a Swiss bank account? Tropico’s production supply chains are much simpler than Anno’s, barely more complicated than Civilization’s. Raw material -> processed good -> ship off the island for money. But it does have a nifty education mechanic. Different buildings require employees of different genders and education levels. You can’t simply overeducate your workforce, because being underemployed makes people dissatisfied and inclines them towards regime change. You could rig the election or kill them, but that has other consequences. You can give them makework, but that gets expensive, especially if you give them makework as teachers and professors and create more education. Tropico has no combat mechanic, unless you count peasant revolt, which I don’t because it can be averted with good enough supply chains. *I picked up Tropico 5 in the latest Humble Jumbo Bundle, which is around until 4/3, but I’m trying to finish Soma in time to review it while the latest Humble Indie Bundle is up, so I haven’t actually tried it. I assume it’s like the last 4 but with more DLC. I highly recommend Banished! It’s Canadian settlers starting a town from scratch. Real-time but speed-adjustable, like Sim City. No combat. Great music. You might want to try out Factorio. Land on an alien planet and build complicated supply chains to fight off aliens. And eventually build a ship to get off the planet, but I never got that far. Previous Previous post: Can History be Moved?